One of the most spectacular Autumn fabric collections you’ll ever see. Autumn Splendor has lush autumn leaves all beautifully touched in metallic gold. 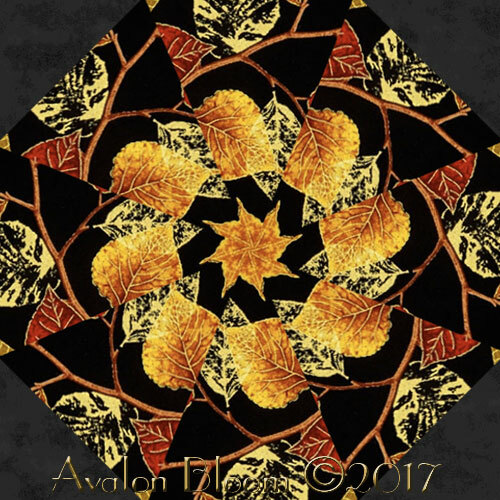 The printing on these fabrics is simply superb, and the colors have all the rich patina of real Autumn leaves.This is a classic collection, perfect for celebrating the season. Colors include black, burgundy, rust, gold and green, all lightly etched in metallic gold. 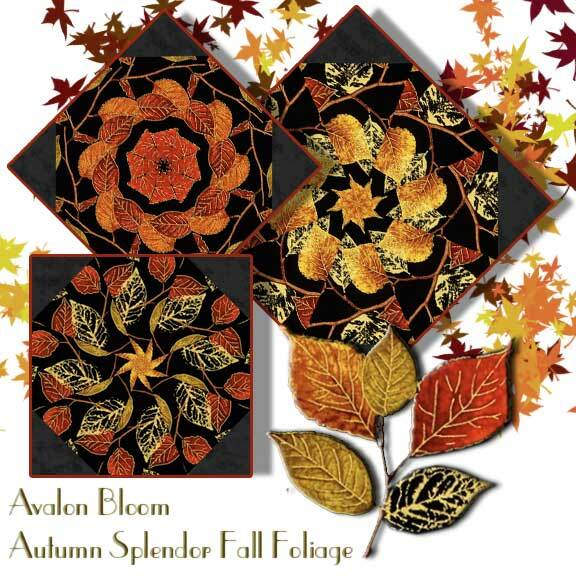 Autumn Splendor Garland by Maria Kolinowski for Kanvas a division of Benartex, Item #: 8414M12B,SKU: 8414M-12 color Black/Multi. This is a kit to make 12 kaleidoscope blocks. Finished dimension for all blocks sewn together is 24 X 32 inches. Each block measures 8 1/2 inches square when sewn. Our Fast and Easy Blooming Blocks© are cut from 100 percent cotton fabric. Each block in the set will be uniquely different due to layering the fabric in exact repeats to create a kaleidoscope effect by precisely rotary cutting them.They are specially cut so that the centers will lie flatter and so there is no bias on the edges of the block so they lie flat in your quilt. You can put these blocks together in a quilt in different ways. Illustrated instructions included to complete the blocks that even a beginner can understand as well as bonus instructions for dimensions to include these blocks in a King, Queen, Double, Twin or Baby Crib, wall hanging quilt as well as a Table Runner or Placemats.